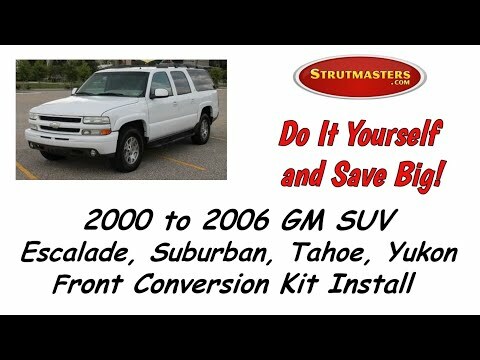 Strutmasters 2000-2006 GMC Yukon 1500 Rear Air Suspension Conversion Kit is the perfect solution to your air suspension problems. Designed to be very affordable, you can convert your ENTIRE air suspension to use passive shocks and coil springs for LESS than the price of replacing just ONE Original Equipment air shock. For best results getting the suspension warning light turned off, we recommend installing a four-wheel conversion kit for this vehicle, item GC14F. 2000-2006 GMC Yukon 1500 Rear Air Suspension Conversion Kit 2WD And 4WD is the perfect solution to your air suspension problems. Designed to be very affordable, you can convert your air suspension to use standard. The parts that make up the air suspension system on the 00-06 Yukon 1500 must always function in sync. When one part isn't working correctly, the system is defunct. This results in expensive trips to the dealership service center, time and time again. Strutmasters' air to non-air suspension conversion kit eliminates this issue for good. The kit, manufactured in the USA, includes two cold-wound steel Eibach coil springs and two shocks for the rear of the vehicle. Customers appreciate that the kit is installed in as little as one hour per wheel, thanks to the detailed installation instructions and installation videos available to view online. ASE certified technicians are on hand and available to answer your questions, saving time and frustration. But the low price of the kit is what seals the deal for most Yukon owners. The cost difference between choosing an air replacement and a non-air suspension conversion kit is considerable. 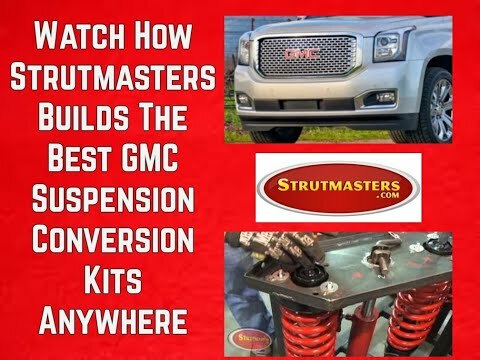 Review these prices so you can make a well-informed decision: that of repairing the air suspension system directly at the GMC dealer, that of installing aftermarket air suspension parts on the Yukon, and that of installing the Strutmasters non-air suspension conversion kit. Your wallet will thank you for choosing the final option. 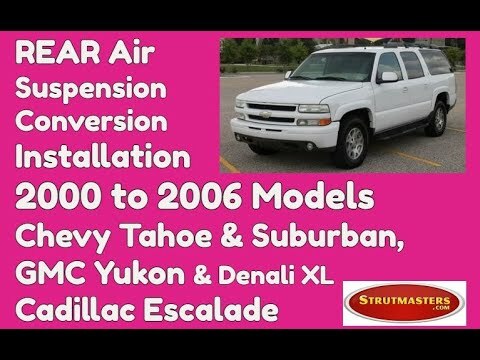 How Do I know If My Yukon 1500, Yukon 1500 XL Air Suspension is failing? If the 2000-2006 GMC Yukon 1500 is unable to meet and maintain its proper ride height then its air suspension system may have failed. Look for the following common signs of a bad suspension system on the vehicle. The most noticeable is a sudden uneven height difference between different sides of the Yukon. Is the rear end sagging? Is the front end inflated? Is there a shifting lean from one side to the other? If any of these signs are occurring, get the suspension fixed promptly! Left unchecked, leaking air bags and dry rot damage can wear out the air compressor. Go ahead and check the air compressor. Is it still working? If so, is it running too often (will be noticeably noisy)? You may still have time before suspension total failure sets in. Lastly, an illuminated suspension warning light on the dash is a sign that the suspension failure is advanced. At this point, an expensive replacement or repair is needed. Choosing the rear air-suspension conversion kit for the 2000-2006 GMC Yukon 1500 saves YOU over $700! 2000-2006 GMC Yukon 1500 Air/Electronic/Magnetic Shocks (x2)- shocks that contain an air bladder or magnets whose dampening capabilities is controlled by the suspension control module. 2000-2006 GMC Yukon 1500 Shock Absorbers (x4)- a metal tubing filled with gas-charged hydraulic fluid that is connected to the wheel of a vehicle in order to reduce the effects of vertical travel on a rough surface which controls the bounciness, and therefore comfort, of a vehicle. 2000-2006 GMC Yukon 1500 Height Sensors (x4)- a linkage located near each wheel of a vehicle with any electronic suspension that, either mechanically or electronically, constantly measures the height of the vehicle, and reports this information back to the control module so that the computer can identify if changes in height need to be adjusted accordingly. The ride height sensor is a moving part, and like all moving parts, they will eventually wear out. 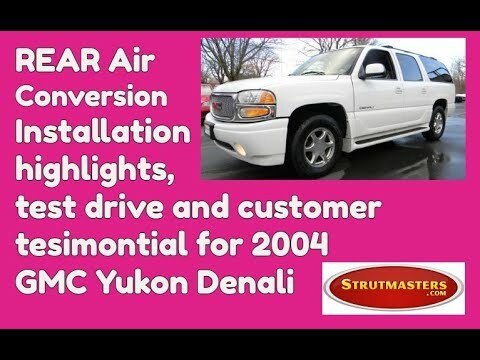 2000-2006 GMC Yukon 1500 Air Lines- tubes that run from a compressor to the air which carry pressurized air to the air bags in order to adjust the height of the vehicle, respectively. 2000-2006 GMC Yukon 1500 Compressor Assembly- creates/sends pressurized to active suspension components. When the air suspension starts leaking, the compressor/pump starts working harder to try to keep the system inflated. By the time air suspension leaks down completely, sitting the vehicle on its tires, the compressor will either have failed or be well on its way to full failure. Buying replacement struts and taking the time to install them only to find out the compressor still needs to be replaced can be very frustrating, time-consuming, and expensive. 2000-2006 GMC Yukon 1500 Dryer- prevents moisture build-up inside of air suspension parts. 2000-2006 GMC Yukon 1500 Suspension Control Module- a computer which is responsible for the operations of the air suspension system and maintaining the vehicle√¢¬Ä¬ôs correct ride height. 2000-2006 GMC Yukon 1500 O-rings- Although they are the least expensive parts of the air suspension, they are responsible for maintaining the seal where all of the air lines connect. Be sure to replace the O-rings when repairing any air suspension system.